September 25, 2018- Buhl Regional Health Foundation announced they will host their 3rd Annual Fall Forum, this year the focus will be on the opioid crisis. 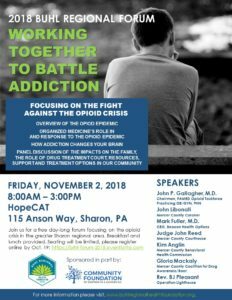 The forum, Working Together to Battle Addiction, will be held Friday, November 2nd from 8:00 a.m. – 3:00 p.m. at Hope Center for Arts and Technology, Inc., 115 Anson Way, Sharon. The daylong event will bring together experts from the community to discuss the fight against the opioid crisis in the greater Sharon regional area. Topics for this year’s forum include an Overview of the Opioid Epidemic, Organized Medicine’s Role In and Response to the Opioid Epidemic, How Addiction Changes Your Brain, and a panel discussion of the impact on the family, the role of drug treatment court, resources, support and treatment options in our community. The Buhl Regional Health Foundation is committed to improving the health and well-being of the neighbors we serve. We believe that through partnerships, education, and grant making, we can creatively impact the quality of life in our communities. In direct response to the feedback from members of our community who attended our first forum, our dual focus is “Access to Healthcare” and “Addressing Mental and Physical Health Needs”. For more information, please email info@buhlrhf.org.